Felt happy when my kid writing x-ray. He's talking about the kid in the x-ray. He got this from their school. My kids x-ray was created after reading the alphabet with his drawing book. a bit more tangible for him plus it's a great into his own alphabet lesson for the week. I am very happy that he learn a lot of stuffs. he is good in spelling he can read and write . very common "xylophone starts with the letter x" He decided to use x-ray instead. The teacher will show this x-rays from their school read book about skeleton, and my kid talk about x-rays. Being inside of the body. he is confusing how the kid get an x-ray and I could explain to him that it need to have the x-ray because people is sick and need a check up to the doctor. He is good in drawing I want him to learn more in reading he keeps study his lesson when we get home from his school more interesting in drawing and also in reading. fun and different and sure to capture your child's imagination. This is my son's creativity I am a proud mom. Print out X-Ray Fish Template. Cut out the template pieces and trace them to the black paper. Cut out the pieces. 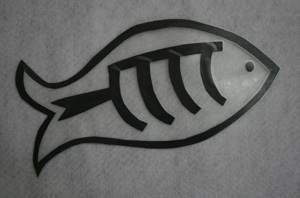 Make sure to cut the center out of the large fish shape so that you are left with the outline only. Cut a rectangular piece of contact paper that is slightly bigger than the large fish outline. Peel the back of the contact paper. Lay the big fish outline onto the sticky side of the contact paper. Put the rest of the pieces of the fish where they belong in the large fish outline on the contact paper. Put the rest of the pieces of the fish where they belong in the large fish outline on the contact paper.